Leaf peeping is an informal term in the United States for the activity in which people travel to view and photograph the fall foliage in areas where leaves change colors in autumn, particularly in northern New England and the upper Midwest.. An organised excursion for leaf peeping is called a foliage tour. A similar custom in Japan is called momijigari. The term "leaf peeper" is used both with appreciation (for those businesses that benefit from the millions that pour into the higher elevations of the West, upper Midwest, and northern New England each fall) and with disdain (from those who have to use the roads that are popular with leaf peepers). Hobbyists who get together for leaf peeping commonly refer to their gatherings as leaf peepshows. "Leaf peeping" is considered an autumn activity throughout the United States and Canada. The term "leaf peeping" has been used in numerous television shows, including "And It's Surely To Their Credit," an episode of The West Wing which originally aired on November 1, 2000 and "Live Free or Die," an episode of "The Sopranos" which originally aired on April 16, 2006. In "Lethal Weapons", an episode of Family Guy, obnoxious New York tourists visiting Rhode Island to see fall leaves are pejoratively referred to as "leafers". Momijigari (紅葉狩), from the Japanese momiji (紅葉), "red leaves" or "maple tree" and kari (狩り), "hunting", is the Japanese tradition of going to visit scenic areas where leaves have turned red in the autumn. It is also called kōyō (紅葉). Kōyō is another pronunciation of the characters for "momiji" which means "fall colors" or "leaves changing colors". It is also called kanpūkai (観楓会) in Hokkaidō, which means "getting together to view the leaves". There is also a tradition of going to see areas where grasses change colour, such as on the Oze plain. 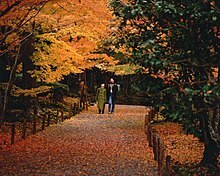 ^ Autumn leaves (koyo) in Japan at japan-guide.com. ^ Sapporo Year-Round: Attractions and Events in Four Seasons Archived 2012-08-20 at Archive.today at the official Sapporo Sightseeing Guide. This article incorporates text translated from the corresponding Japanese Wikipedia article as of November 28, 2006. This page was last edited on 6 February 2019, at 19:39 (UTC).